This is an image of the artwork titled ‘Ladder of Virtues’ by Herrad of Lansberg, a nun of Hohenburg Abbey. The artwork was contained in a medieval manuscript called the Hortus deliciarium until it was destroyed during a siege on Strasbourg, France in 1870 where the work was being held. Fortunately, it is possible to reconstruct parts of the manuscript because portions of it had been copied in various sources. The manuscript contained hundreds of images, as well as songs, poems and texts from classical and Arab writers. It was used as a training tool for young novices at the convent and was begun in 1167 and finished in 1185. 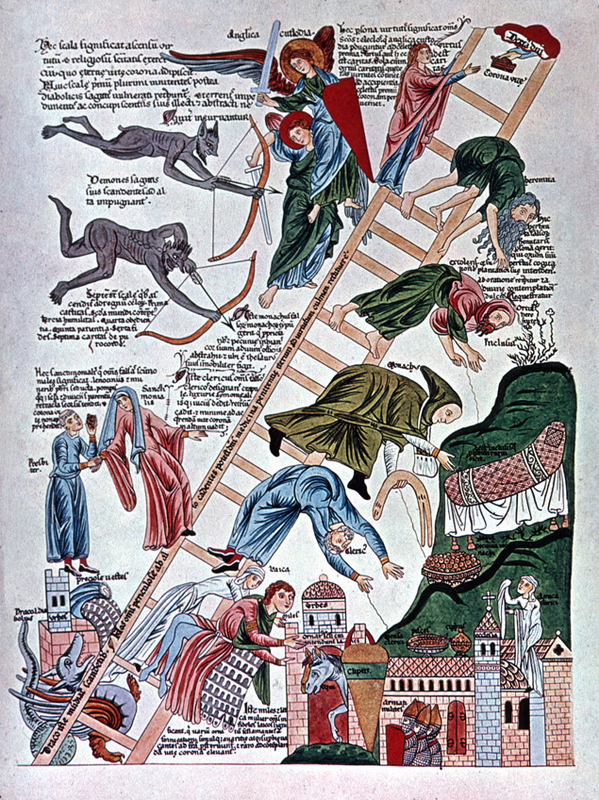 The Ladder of Virtue shows men and women attempting to climb the ladder of virtue while being attacked by demons, causing them to fall from their righteous path to the heavens. Interestingly, the figure receiving the crown from God is a woman not a man, perhaps a nod from the artist to empower women. The artist displays a very basic concept of depth, showing that images farther away are smaller but not scaling them proportionally with the distance between them. Most of the negative space in the work is filled with text, giving a very cluttered feel to the work. The tone is very religious, and also evokes a fear of not making it to heaven. Many colours are present from the robes as well as the creatures and buildings in the artwork. The artist depicts movement in a very basic way by outreaching the hands of the figures from the bodies.